← Lame Adventure 313: What Do I Know? Broadway’s annual love fest to itself, the Tony Awards, will be broadcast this Sunday on CBS. My pal, Milton, who has seen more of the nominated plays and musicals than me, has donned his critic’s chapeau and has written a witty and insightful post about all the contenders right here. 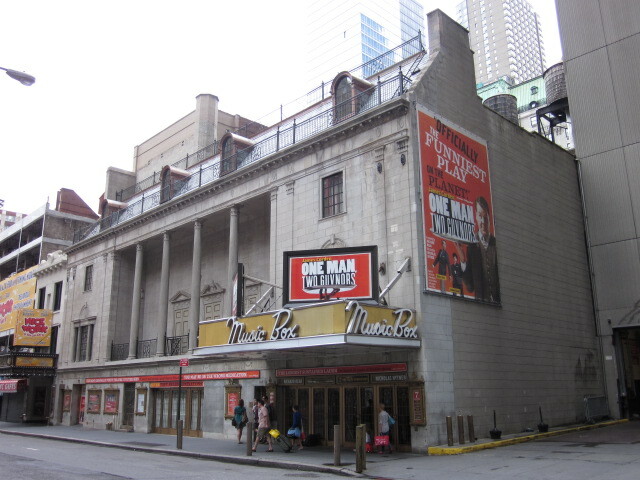 A few weekends ago I did the unthinkable — I cut short my power sleeping and headed down to the theater district where I photographed the facades of the buildings housing the nominated plays and musicals in morning light. 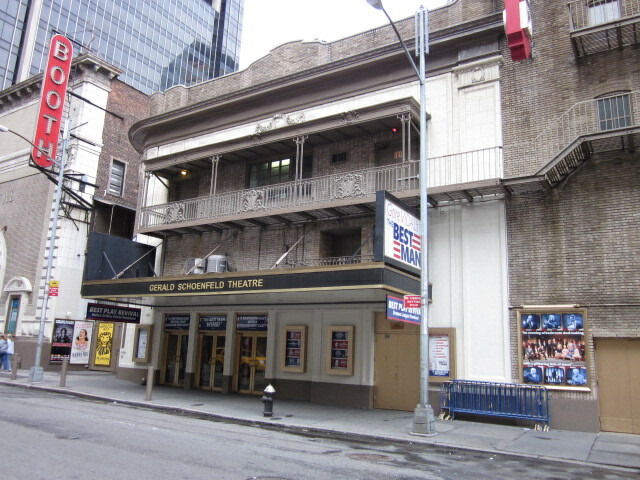 This is not exactly tantamount to snapping a gotcha shot of one’s girlfriend without her makeup, but I realized I had little idea about what most Broadway houses look like. Absent the crowds clambering to enter under the sophistication of nightfall, many of these buildings are surprisingly quaint when viewed in the light of day. 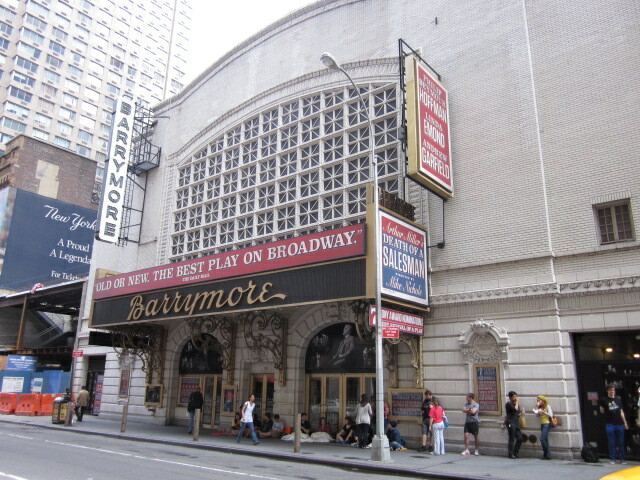 Pictured below is the Ethel Barrymore Theatre located on West 47th Street. If these walls could talk, would they scream, “Stella!”? A much-ballyhooed revival of Arthur Miller’s Death of a Salesman starring Philip Seymour Hoffman just closed there. It will probably win big on Tony night. This is the theater where in 1947 Marlon Brando originated the role of Stanley Kowalski screaming “Stella!” in A Streetcar Named Desire. Currently, Blair Underwood is screaming “Stella!” in a revival of Streetcar featuring an African-American cast staged at the Broadhurst on West 44th Street. “Stella!” screamed here eight shows a week until August 19th. Back in 1935, Humphrey Bogart stood on those same boards making his acting breakthrough that led to Hollywood stardom when he appeared as an escaped killer in The Petrified Forest, a role he later recreated in the film of the same name. 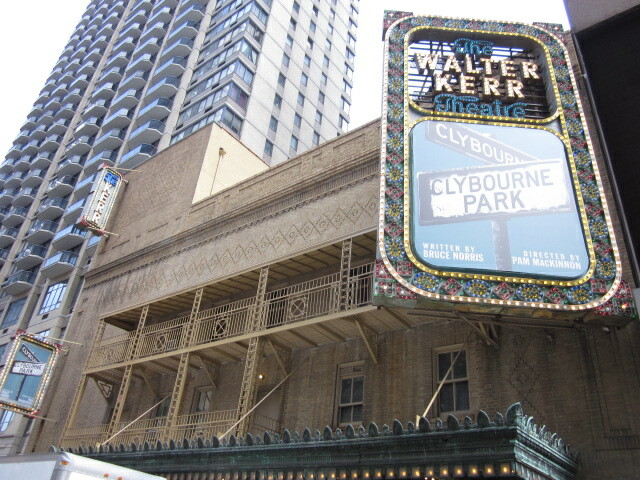 The Pulitzer Prize winning social satire Clybourne Park (and my choice for Best Play where you can hear a terrific joke about white women and tampons) can be seen here at the Walter Kerr Theatre. The neon lights burn 24/7 at the Walter Kerr who was a theater critic and playwright that died in 1996. Back in 1929 when it was then called the Ritz Theatre (undoubtedly to differentiate it from the cracker which Nabisco would debut in 1934 but according to the Lame Adventures brand of (il)logic someone clearly had a premonition that this snack food was on the horizon), Bette Davis starred on this same stage opposite the slightly less well-remembered Etha Dack in a comedy called Broken Dishes. Over at the Gerald Schoenfeld 81-year-old James Earl Jones and almost 87-year-old Angela Lansbury are energetically co-starring in the revival of Gore Vidal’s The Best Man. Living theater royalty can be found within these walls through September 9th. Gerald Schoenfeld was a legendary Broadway producer. Three years before he bought his rainbow in 2008, a theater was named in his honor. 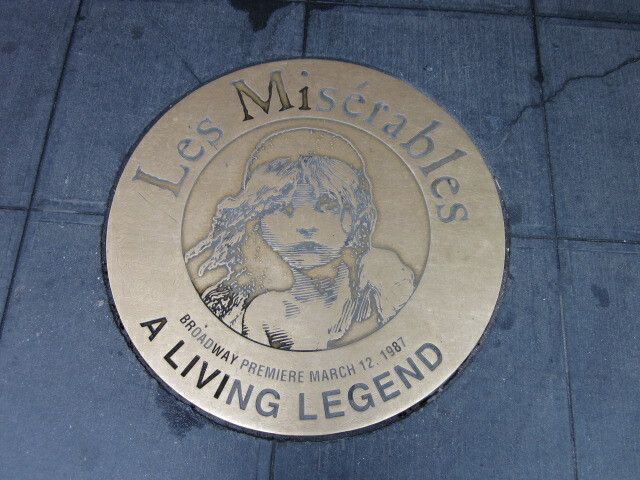 Broadway has several theaters that were renamed for theatrical legends. 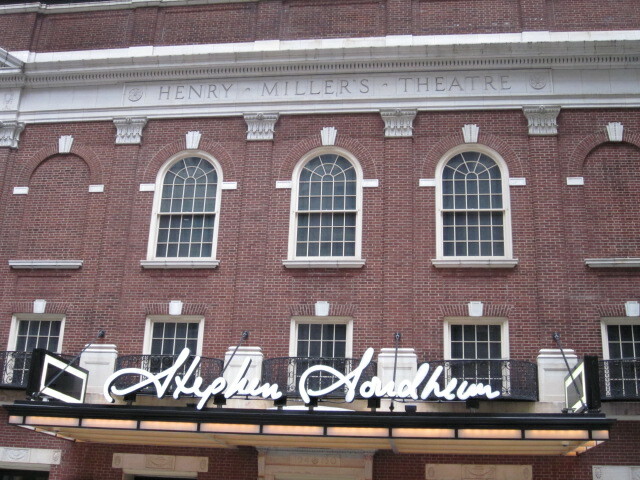 In the case of the recently renovated Stephen Sondheim Theatre, the theater had been originally named for Henry Miller. 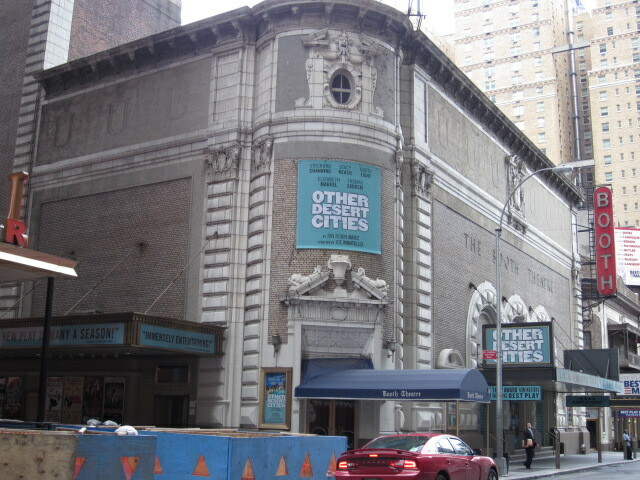 Even if Henry Miller’s name is still carved in the facade, this is the Stephen Sondheim theater now. Currently staging the revival of “Anything Goes” (including Henry Miller’s name). In 1983 the Alvin Theatre was renamed for the playwright Neil Simon. The last play staged at the Alvin was Mr. Simon’s Brighton Beach Memoirs. The first play that opened under his name was Mr. Simon’s Biloxi Blues. 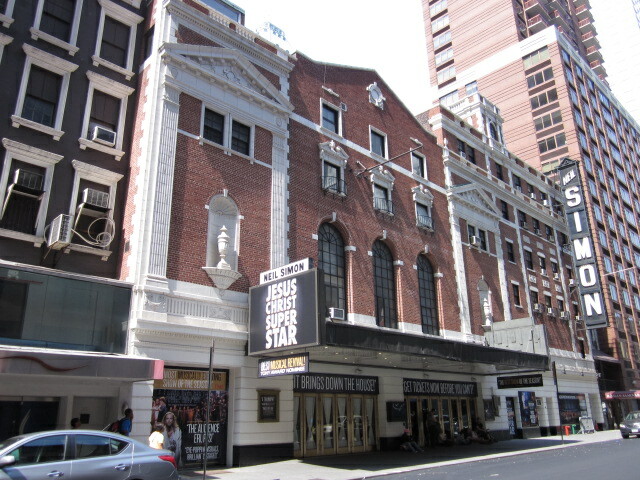 Currently a revival of Jesus Christ Superstar is being staged there, the exact type of production that must make this revered Jewish playwright gag. What about legends in the making? Possibly one day a theater will be renamed for the 28-year-old powerhouse Nina Arianda currently starring opposite Hugh Dancy in Venus in Fur over at the Lyceum. “Venus in Fur” is closing June 17th, but my superior, Elsbeth, managed to snag a pair of prized ducats to this show before it ends its run probably just to get me to stop my hounding. Nina owned my vote for Best Actress in a play until I saw Tracie Bennett as Judy Garland in End of the Rainbow at the Belasco. “End of the Rainbow”, a show that was made for a post-performance stiff drink (or two or three). Now I’m completely discombobulated over who should get it, but Milton reasons that even if Nina is stiffed, she’ll eventually win it, so he’s pulling for Tracie. 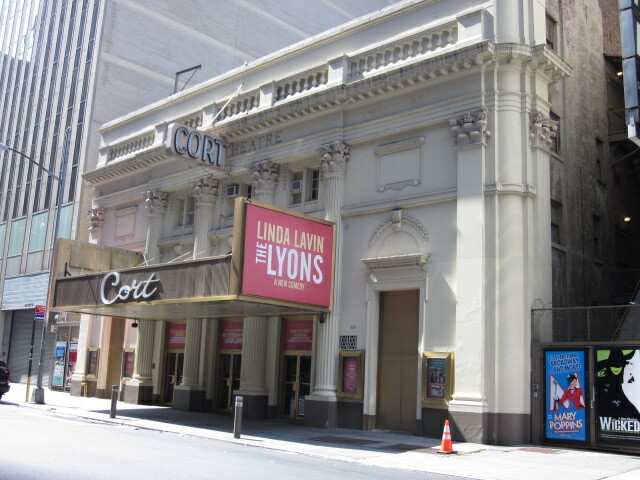 In addition, I thought Best Actress nominee Linda Lavin was terrific as the mother that loathes both her children and her dying husband in The Lyons over at the Cort. See and hear Linda Lavin roar! Stockard Channing is another Best Actress nominee that can be found eight performances a week at the Booth Theatre as the mother in Other Desert Cities. 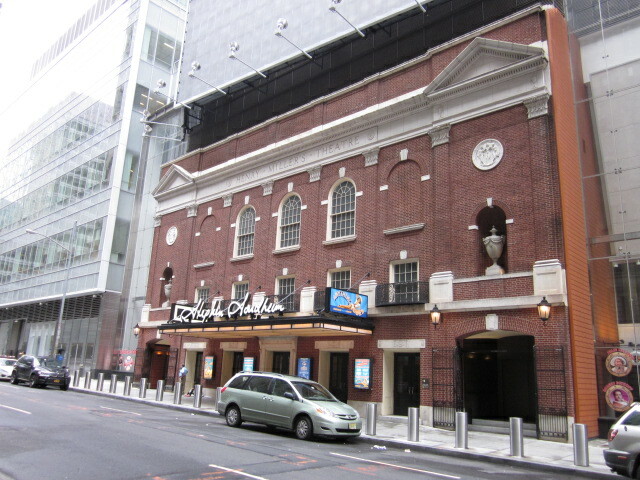 The Booth Theatre opened on October 16, 1913. Looking pretty good for pushing 100. 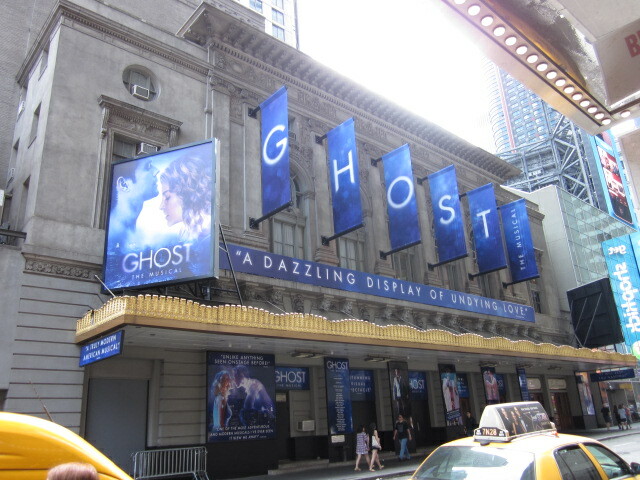 This show is another Best Play nominee that has scored a hit with both the critics and audiences. The Booth was named for Edwin Booth, the brother of John Wilkes. Apparently, a grudge was not held against him considering whom his brother assassinated. Across the street from the Booth is the Music Box where the raucous British comedy “One Man, Two Guvnors” is being staged. 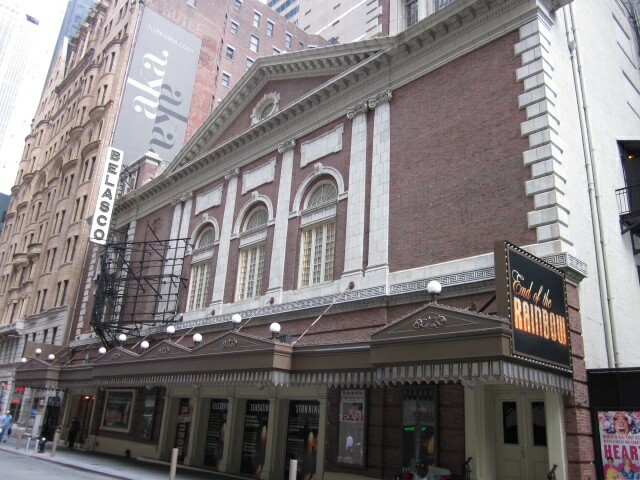 Marlon Brando made his Broadway debut here in “I Remember Mama” in 1944. 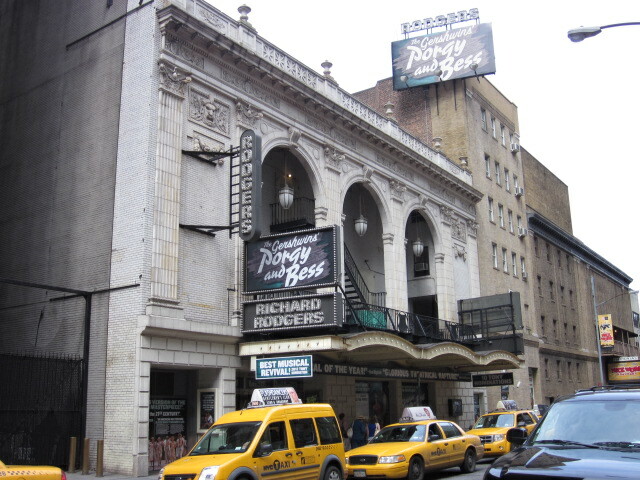 A viable contender for Best Revival of a Musical is The Gershwins’ Porgy and Bess over at the Richard Rodgers. Full disclosure: I loved this wonderful production and the stars, Audra MacDonald and Norm Lewis, blew me away. Oh yeah, and the music’s extraordinary. “The Gershwins’ Porgy and Bess” – an excellent production. For all you sock puppet fans, in 1994 Shari Lewis commanded this same stage with Lamb Chop, Hush Puppy and Charlie Horse in Lamb Chop on Broadway. Critics see a horse race between Porgy and Bess and the now closed revival of Stephen Sondheim’s Follies that was staged at the Marquis Theatre. 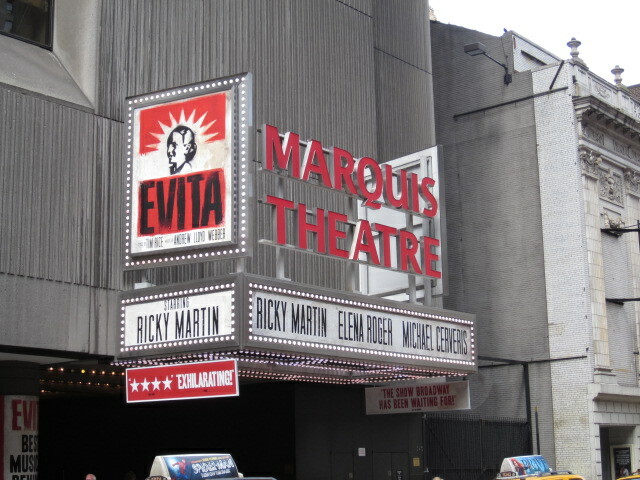 Follies shuttered to make way for the revival of Evita, which is also nominated in this category, but it is not expected to win. The Marquis is a theater that is literally a massive marquee. I see the name. Where’s the entrance to see the show? The first, and thus far only time I saw a show there (the most recent revival of Follies), I had no idea where to find the entrance. It’s situated in a Marriott Hotel. Since I was not a guest, I was denied the option to call room service to ask, “Where the hell’s the theater?” Fortunately, Milton arrived first so I was screaming at him, and he was screaming directions at me on his iPhone. I’m sure people unaware that we’re more queer than (accounting for inflation) a nine dollar bill assumed I was yelling at my husband and he at his wife. 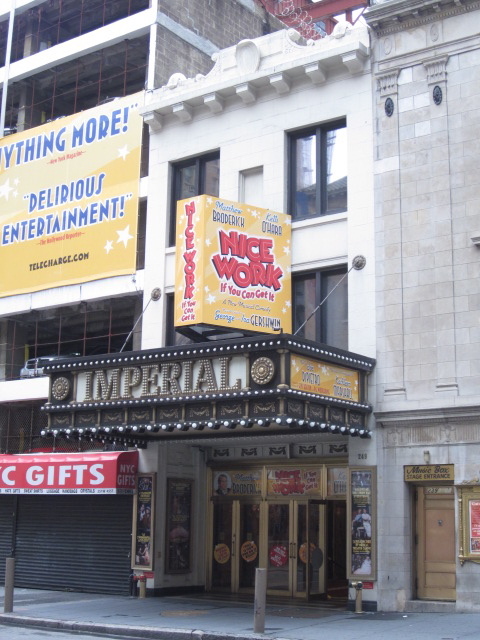 Nicer work at the Imperial’s box office was when “Les Misérables” ran here for over 12 years of its 16 year run. Certainly a living legend at the theater box office. Considering that locating the Marquis easily shaved several minutes off my life, I much prefer a classic easy-to-locate Broadway theater like the Nederlander, which is currently staging the Disney production nominated for Best Musical, Newsies. 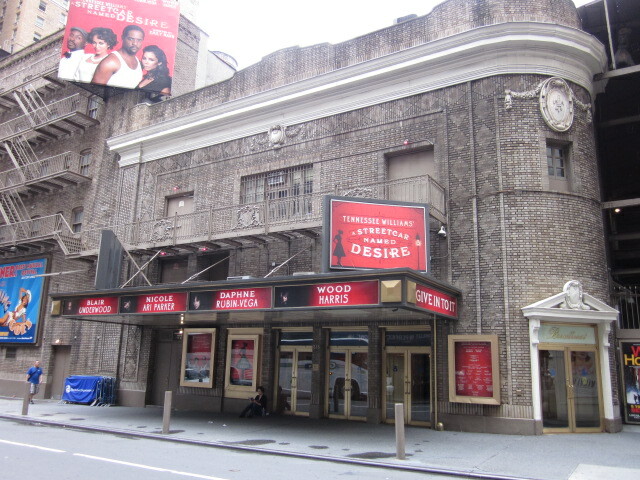 Edward Albee’s “Who’s Afraid of Virginia Woolf” debuted here in 1962 when it was called the Billy Rose Theatre. That production cost $42,000 to stage. This is a big, brassy feel good show that has about as much appeal to me as a full body rash. 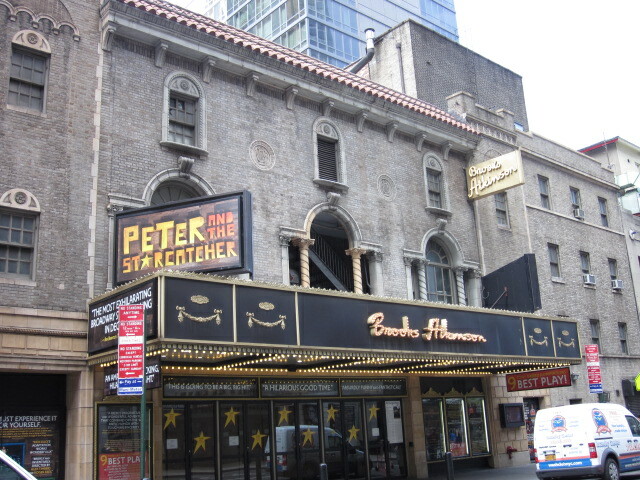 “Peter and the Starcatcher” – a fun show about lost boys. Brooks Atkinson was a theater critic for The New York Times from 1925 to 1960. 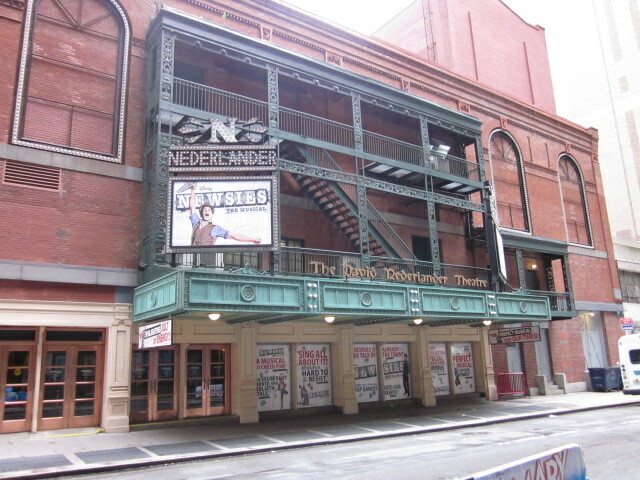 I’m hoping that Once over at the Bernard B. Jacobs Theatre will win Best Musical since I relate much more to miserable people in Dublin than singing dancing newsboys in lower Manhattan circa 1899. Before the show starts, “Once” audience members can walk on the stage and purchase a drink at the on stage bar. Truly this is my kind of show. 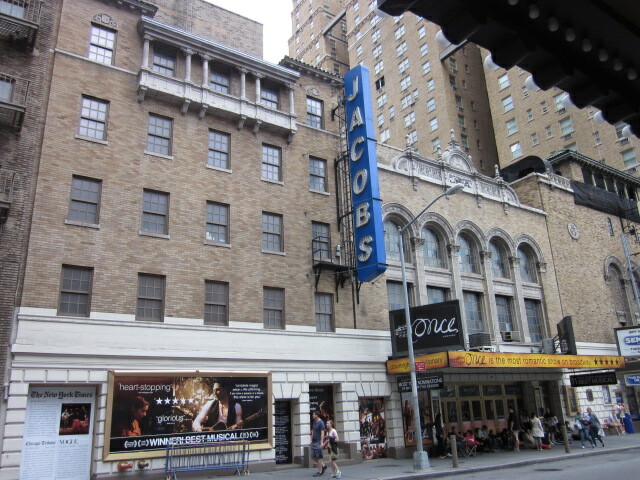 In 1927, the first show staged at the Jacobs (then called the Royale) was a musical comedy named Piggy. The producers changed the show’s name to I Told You So in the middle of the run. Apparently, they resisted renaming the show I Told You So That Piggy is a Terrible Name and We’re Bleeding Money. 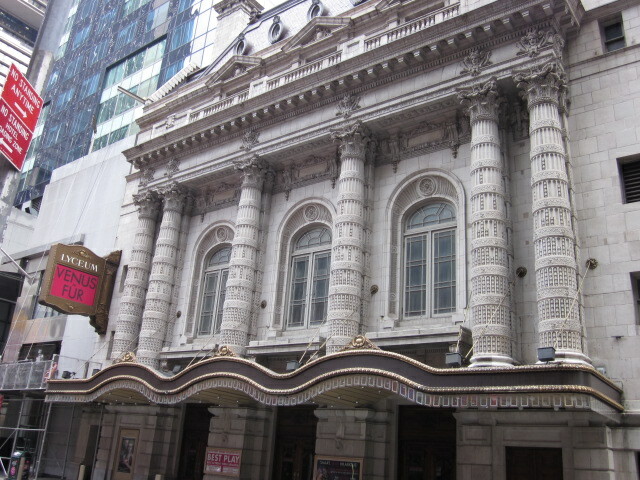 This entry was posted in Humor, new york city, theater and tagged Broadway, marlon brando, stage, tony awards. Bookmark the permalink. What a truly wonderful post! NYC beckons…. I haven’t been back for a couple of years now and I have been going through withdrawal and now have the shakes after reading your post! Oh, how I would love to see any of these. Maybe we can stop by in September…. New York New York! It’s a wonderful town! It is definitely a wonderful town especially if you avert your gaze from what’s scurrying along the subway tracks. That would be so cool if you visited the Apple Susie. Keep me posted if you do! Glad you enjoyed the post TTThomas! Thanks for visiting and commenting. NYC’s my oxygen. If I’m away from this place for too long I’m like a beached carp gasping on the sidewalk. Not a pretty sight. I’ve enjoyed this tour of theatre land LA. When I visited New York decades ago I don’t think I paid too much attention of the buildings as I was in so much awe that I was in New York City. Great post! Tom, I’ve lived here practically thirty years, I’ve seen hundreds of Broadway shows, and I can’t say I ever really paid much attention to the theaters until last month when I took these photos. I’ve just been a clueless dolt all this time. Glad you liked the post. Are the Olivier Awards a big deal on the telly across the pond? I’m not much of a TV watcher, either, so you have company in your lack of TV watching doltage. I don’t even want to speculate how long it’s been since I’ve seen a play on Broadway, but I suppose tonight’s be the big night. Great post, my friend. Maybe one day you and Sara can visit the Apple and see a show! Hey, there are a lot of publishers up here … Make it a working vacation. Glad you liked the post Kathy. I saw and *loved* “The Best Man” when it was previews. It was my first, and thus far my only Broadway foray. Kind of criminal, seeing that I live a bus ride away. I should keep this post and cross off the theaters as I go along. That was an excellent production! That’s a show with both a great script and such terrific atmosphere. When you know when you’re coming back down here, give me a head’s up. I will share all my secrets about how to get good seats at a discount. Thanks Milton! There’s just so much history packed in all those houses, it can boggle the mind. Thank you for the tour and for waking up early! A lovely post and a nice, easy trip from my seat here in Boise. I am so not a morning person SDS, but there was no way I could take those pix later in the day. The crowds in Times Square build quickly! glad I could bring a little dose of Broadway to Boise! Love this post! As you stated, the simple nature of some of these buildings away from the hustle and bustle has much to say. Well done! Glad you enjoyed it! I’ve seen so many shows through the years but the buildings are all such a blur until I took a few hours to focus on them. I assume this is a tragic mistake on your part for not listing this wonderful production from 1939 at The Broadhurst! Of course I purposely excluded mentioning that bit of fool’s gold in the hope it would motivate you to enlighten our readership Max! I recall reading a while back that you are not a great fan of Paterson, NJ, legend Lou Costello. As a proud Jerseyite I’d respond in the colloquial Passaic County patois, but probity argues against it. I did not watch the Tony Awards on Sunday evening, but learned that your intuition/taste/perceptions were right and that *Once* cleaned up. I did hear that Doogie likened the Tonys to 50 Shades of Gay. Loved that one. NPH is a terrific host. He opened the broadcast with that joke. Everywhere I look on the subway there’s some woman reading that novel. I guess it’s the “Twilight” for women that like to do it. I didn’t go near “Twilight”, either. Think I’d rather read a lawn mower manual. Bud and Lou and the lady with the tutti frutti hat ain’t fool’s gold!!!! LOLLLL!!! I first learned of Bud & Lou making their Broadway debut in this play at The Broadhurst when I first saw a play there back in the 80’s! I forgot the play but not the fact the Bud & Lou performed on that very stage! If the play was the 1986 revival of Long Day’s Journey Into Night that was staged there, the psychic in me is certain that Eugene O’Neill is going to come back from the dead just to personally beat you over the head with a bottle for only recalling that thin thread of trivia. LOL..I did see that play but in 2003 in another theatre as I do love Eugene O’Neill’s work! That was fun Sam. Thanks for sharing. Good pictures. I’m sure they’re all snazzy at night, but the daylight adds a different perspective. Daylight is almost indecent exposure. The producers understandably want all the attention drawn to what’s playing on the marquee — not what the building looks like, but I realized that I never really focused on the buildings. When I took most of those shots it was truly like I had seen those buildings for the first time — and I’ve lived out here 30 years come August.